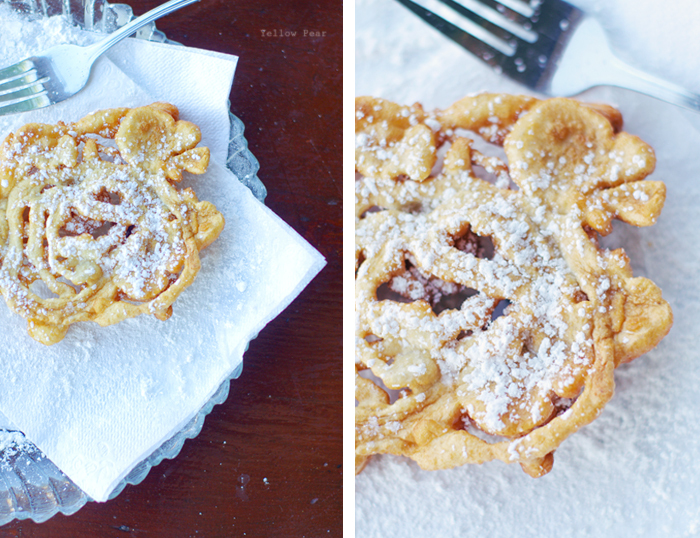 The kids have been hounding me to make funnel cakes. We got a kit from my sister a few Christmases ago but have since ran out of the batter mixes. Luckily we live in a day and age where anything can be found at the click of a button (although that's scary too). And our children are smart enough to do just that (and that's even scrarier). So as you've probably guessed, Miss B looked up Funnel Cake Batter recipes online, printed one that she thought suitable and waved it at me when I protested that we had no batter mix left. What could I say? Well actually I said we were out of flour (which we were). So upon buying more flour, I was out of excuses and we finally set out on our giant mess-making, funnel cake-frying adventure/extravaganza. They were delightful and tasty, especially with fresh strawberries. And then we had dinner after. A little backwards, but heck...it's fun to shake things up once in awhile. Speaking of shaking, there was powdered sugar EVERYWHERE. Also, never inhale while taking your first bite of a funnel cake topped with powdered sugar. It results in coughing fits. Just ask Dennis. He knows. I love that each cake turns out so different...kind of like snowflakes. Miss B made the one below. I enjoy its crazy randomness. What is it about fried dough and mounds of powdered sugar?